//Declare an integer pointer array of five elements. // Initialize index 0 and 1 of the array with integer pointers. // Assign values to index 0 and 1. // Declare a string array of five elements. // Declare a second string array of five elements. // Initialize the array with colors. // Copy the values from array2 into array1. // Declare a string pointer array of three elements. // Declare a second string pointer array of three elements. // Initialize the array with string pointers. // Declare and initialize index 1 and 3 of the outer array. // Allocate an array of 8 megabytes. // Pass the address of the array to the function foo. // Function foo accepts a pointer to an array of one million integers. // Create a slice of strings. // Contains a length and capacity of 5 elements. // Create a slice of integers. // Contains a length of 3 and has a capacity of 5 elements. / Create a slice of integers. // Contains a length and capacity of 3 elements. // Initialize the 100th element with an empty string. // Create an array of three integers. // Create a slice of integers with a length and capacity of three. // Create a nil slice of integers. // Use make to create an empty slice of integers. // Use a slice literal to create an empty slice of integers. / Create a new slice. // Create a new slice. // Contains a length of 2 and capacity of 4 elements. // Allocate a new element from capacity. // Assign the value of 60 to the new element. // Slice the third element and restrict the capacity. // Contains a length and capacity of 1 element. // Append a new string to the slice. // Create two slices each initialized with two integers. // Append the two slices together and display the results. // Contains a length and capacity of 4 elements. // Iterate over each element and display each value. // Iterate over each element and display the value and addresses. // Iterate over each element starting at element 3. // Create a slice of a slice of integers. // Append the value of 20 to the first slice of integers. // Create a map with a key of type string and a value of type int. // Create a map with a key and value of type string. // Initialize the map with 2 key/value pairs. // Create a map using a slice of strings as the key. // Create a map using a slice of strings as the value. // Create an empty map to store colors and their color codes. // Add the Red color code to the map. // Create a nil map by just declaring the map. // Retrieve the value for the key "Blue". // Did this key exist? // Create a map of colors and color hex codes. // Display all the colors in the map. // Remove the key/value pair for the key "Coral". // user defines a user in the program. // Declare a variable of type user. // Declare a variable of type user and initialize all the fields. 02 // compiler supports them. 09 // user defines a user in the program. 15 // notify implements a method with a value receiver. 22 // changeEmail implements a method with a pointer receiver. 27 // main is the entry point for the application. 30     // declared with a value receiver. 35     // declared with a value receiver. 40     // declared with a pointer receiver. 45     // declared with a pointer receiver. struct type类型使用的时候要考虑是按值传递还是按引用传递。 下面是摘抄自原文page122的话: The decision to use a value or pointer receiver should not be based on whether the method is mutating the receiving value. The decision should be based on the nature of the type. One exception to this guideline is when you need the flexibility that value type receivers provide when working with interface values. 02 // how the scheduler behaves. 11 // main is the entry point for all Go programs. 13     // Allocate 1 logical processor for the scheduler to use. 16     // wg is used to wait for the program to finish. 17     // Add a count of two, one for each goroutine. 23     // Declare an anonymous function and create a goroutine. 25         // Schedule the call to Done to tell main we are done. 36     // Declare an anonymous function and create a goroutine. 38         // Schedule the call to Done to tell main we are done. 49     // Wait for the goroutines to finish. 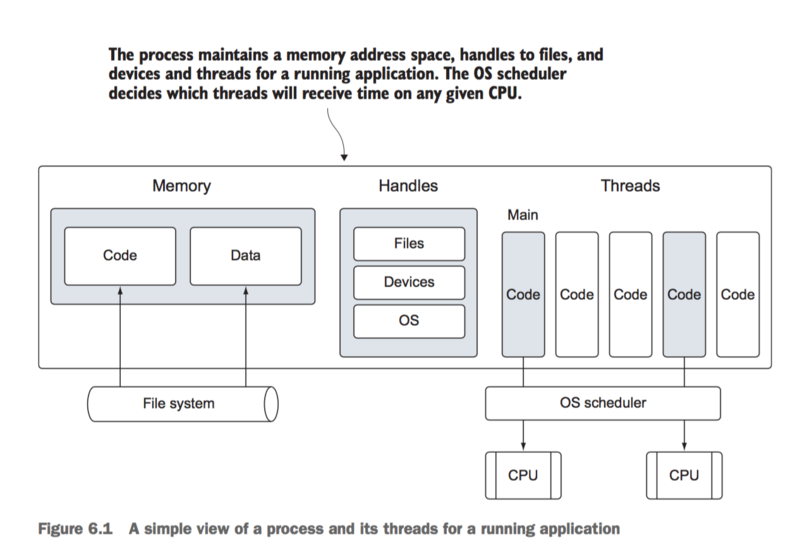 // Allocate a logical processor for every available core. It’s important to note that using more than one logical processor doesn’t necessarily mean better performance. Benchmarking is required to understand how your program performs when changing any runtime configuration parameters. 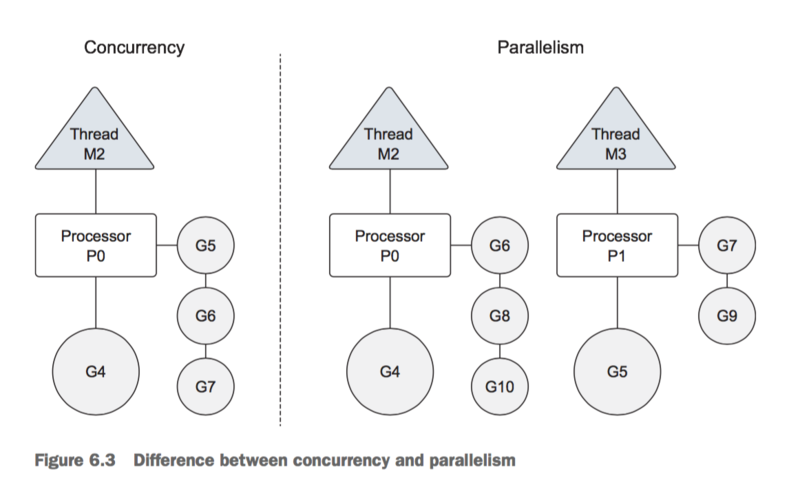 Remember that goroutines can only run in parallel if there’s more than one logical processor and there’s a physical processor available to run each goroutine simultaneously. 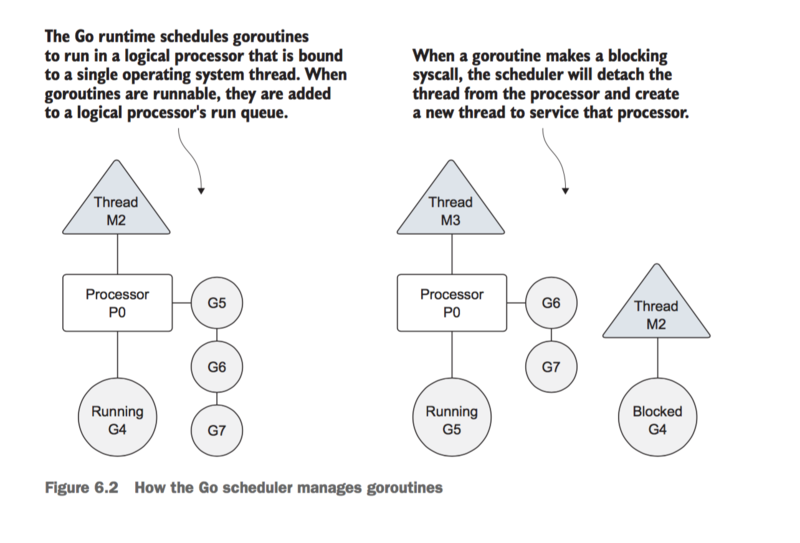 Goroutines are executed within the scope of a logical processor that owns a single operating system thread and run queue. Atomic functions and mutexes provide a way to protect against race conditions. Channels provide an intrinsic way to safely share data between two goroutines. Unbuffered channels provide a guarantee between an exchange of data. Buff- ered channels do not. // Unbuffered channel of integers. // Buffered channel of strings. // Send a string through the channel. // Receive a string from the channel. // channel to simulate a game of tennis between two goroutines. // wg is used to wait for the program to finish. // main is the entry point for all Go programs. // Create an unbuffered channel. // Add a count of two, one for each goroutine. // Wait for the game to finish. // player simulates a person playing the game of tennis. // Schedule the call to Done to tell main we are done. // Wait for the ball to be hit back to us. // If the channel was closed we won. // Pick a random number and see if we miss the ball. // Close the channel to signal we lost. // Display and then increment the hit count by one. // Hit the ball back to the opposing player. // channel to simulate a relay race between four goroutines. // Add a count of one for the last runner. // First runner to his mark. // Wait for the race to finish. // Runner simulates a person running in the relay race. // Wait to receive the baton. // Start running around the track. // New runner to the line. // Running around the track. // Is the race over. // Exchange the baton for the next runner. 摘抄自原文: 6.5.2 A buffered channel is a channel with capacity to hold one or more values before they’re received. These types of channels don’t force goroutines to be ready at the same instant to perform sends and receives. There are also different conditions for when a send or receive does block. A receive will block only if there’s no value in the channel to receive. A send will block only if there’s no available buffer to place the value being sent. This leads to the one big difference between unbuffered and buffered channels: An unbuffered channel provides a guarantee that an exchange between two goroutines is performed at the instant the send and receive take place. A buffered channel has no such guarantee. numberGoroutines = 4  // Number of goroutines to use. taskLoad         = 10 // Amount of work to process. // Go runtime prior to any other code being executed. // Seed the random number generator. // Create a buffered channel to manage the task load. // Launch goroutines to handle the work. // Add a bunch of work to get done. // when all the work is done. // Wait for all the work to get done. // Report that we just returned. // Wait for work to be assigned. // This means the channel is empty and closed. // Display we are starting the work. // Randomly wait to simulate work time. // Display we finished the work.